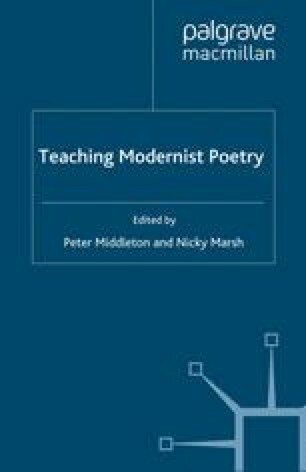 Women’s poetry poses a number of additional challenges to the teacher and the student on top of the already demanding job of bringing modernism into the lecture or seminar room. When asked which modernist poets they know, two names will usually be forthcoming (certainly from British students), that of T. S. Eliot and Ezra Pound. It is remarkable that this is still the case, particularly as poets such as H.D. (Hilda Doolittle) and Gertrude Stein shared the international modernist stage in their time. They, like Pound and Eliot, travelled from America to Europe before the First World War where Stein settled in Paris, surrounded by her renowned salon of modernist painters, while H.D., in London, became a key figure in the formation of Imagism (arguably the mother of Anglo-American poetry). Meanwhile British-born Mina Loy moved between the modernist centres of activity (Paris, Florence, and New York) while Marianne Moore, after a brief flurry of travel, remained resolutely at home in New York. These four women are the key first-generation Anglo-American women poets on whom I shall concentrate in this chapter.1 Many students do not know that experimentation in poetry has continued unceasingly to this day; this essay ends with a discussion of contemporary women poets in the modernist tradition. Fraser, Kathleen Fraser feature, includes ‘Interview of Kathleen Fraser, conducted by Robert Glück, April, 2002’, Cauldron and Net 4 (http://www.studiocleo.com/cauldron/volume4/features/fraser/index.html).